140 ND NIGERIA (1986) Crocodile* Imperforate pair. Scott No 485, Yvert No 477. 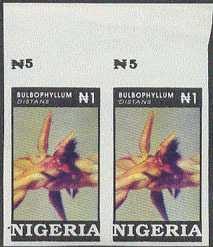 141 ND NIGERIA (1986) Chameleon* Imperforate pair. Scott No 487, Yvert No 479. 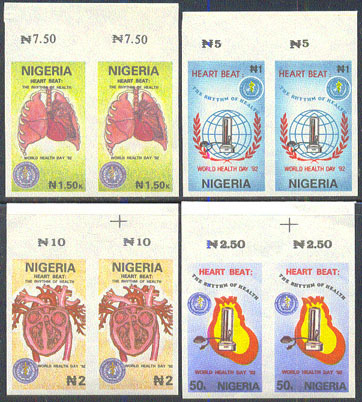 1445 ND NIGERIA (1992) Anatomy of heart*. Blood pressure machine*.Anatomy of chest cavity*. Set of 4 imperforate pairs. World Health Day. Scott Nos 594-7, Yvert Nos 604-7. 1356 ND NIGERIA (1993) Bulbophyllum distans*. Imperforate pair. Scott No 624, Yvert No 616. 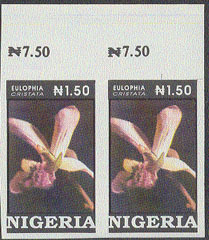 1357 ND NIGERIA (1993) Eulophia cristata*. Imperforate pair. Scott No 625, Yvert No 617. 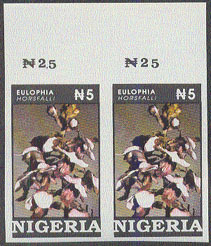 1358 ND NIGERIA (1993) Eulophia horsfalli*. Imperforate pair. Scott No 626, Yvert No 618. 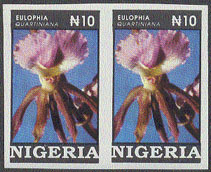 1359 ND NIGERIA (1993) Eulophia quartininiana*. Imperforate pair. Scott No 627, Yvert No 619.